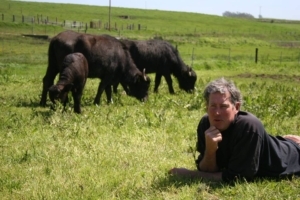 Ramini Mozzarella of Tomales, CA was founded in 2009 by my husband Craig and myself (Audrey), with a dream of raising Italian water buffalo and becoming the only Americans currently making authentic, artisan buffalo mozzarella. We love animals and wanted to spend our days with these amazing, exotic creatures. We’d learned they could be as loving as dogs if treated with affection and care. We also learned no one at that time was producing buffalo mozzarella in the US. We knew the cheese was incredible and thought; Americans should have this cheese produced domestically and experience what the Italians have discovered in these rich, porcelain white, creamy balls of fresh cheese. It’s shelf life, if made as the Italians do, should only be 3 days. Importing it from Italy means we are getting it, more than likely, past it’s prime or previously frozen. The challenge was on and we were ready! We began with 5 water buffalo, a shoe string budget and a big dream. The first 4 years were amazing as we learned and grew with the herd, living our dream, building relationships with the buffalo, and learning to make the cheese. 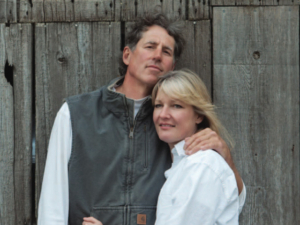 We rented a small farm and pasture, renovated the dairy and designed a farmstead creamery. By 2012 we were successfully selling out of all the cheese we could produce. Tragically in 2014 Craig was diagnosed with Non Hodgkins Lymphoma. I strapped on my boots and rubber pants and ran the dairy and creamery alone while Craig underwent his treatment. He was in complete remission after 6 months and we were elated. Then it hit, a month later he felt poorly. Scans and tests revealed the cancer was now in his brain and spine. Three months later Craig passed away with the dairy by then shut down and I by his side. I reopened a month later at the request, and with the support of our customers. I have kept the dream alive now for a whole year without him, proving to myself I can do this, but the herd is growing fast and now the buffalo and I need your help. The herd has grown to 45 and I expect 10 babies in early 2016. In the past year I processed 25,000lbs of milk, making 60-80 lbs of cheese twice a week and personally delivering to the 8 local restaurants that love it. I also sell direct to the public from the creamery for those willing to make the trip to Tomales. I am currently doing this with two milking stalls and one wheelbarrow. We sell out with in 24 hours of each batch, have a public cry for retail and a waiting list of restaurants who want the cheese on their menu. Ramini Mozzarella has stayed alive despite what life presented us with but the company needs to grow with the herd. The local community has been incredible in supporting the company and me. It was Craig’s dream initially but I immediately fell in love with the idea, animals, cheese and spending my days by my husbands side as we tackled every hurdle. Ramini Mozzarella is our baby, we raised it together. I look to Temple Grandin and Alice Waters for inspiration. The goal was originally cheese but as I have developed relationships and techniques with these very present and sometimes intimidating animals. I also have a goal to teach adults and children about the animals and our husbandry practices. 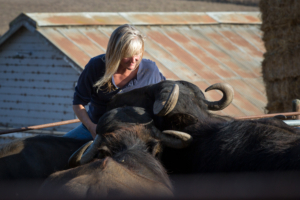 Water Buffalo are sensitive loving animals that respond to human touch and affection with equal affection. This relationship is very special. In exchange for giving them love they have a release of oxytocin and give up their milk. We train our animals to come in and give milk using the reward system so each animal has made the decision that they want to be milked. Our babies are hand raised and socialized to love human contact and interaction. I would like to someday have the opportunity to teach children about how farm animals actually love to provide for us and interact with us and what that relationship can be if nurtured. 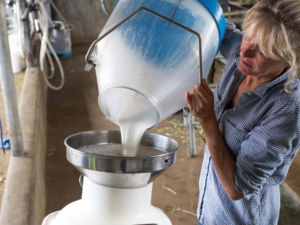 In addition to our Saturday tours where people can experience this relationship first hand and taste the cheese we also host private tours to culinary students who want to learn more about ranching and cheese making. This year students from the Culinary Institute of America came twice, a group of budding chefs from Thailand and 50 students from UC Davis Veterinary Program came to learn and experience first hand what we are doing. If Ramini Mozzarella is able to stay alive and thrive I hope to open a retail shop in Marin very soon. I love the idea of a shop with several local artisan cheese companies, including Ramini Mozzarella in the Marin Country Mart and perhaps some day we could be in the San Francisco Ferry Building. In the future it would be great to see Buffalo Mozzarella produced by other artisan creameries across the US. Even the Italians support us in having this cheese domestically, they invited Craig to Italy and taught him how to make the cheese after learning we were having trouble with our recipe. I have taken on many interns and apprentices who have the dream of making mozzarella and want to know how we have come this far with such a challenging undertaking. Marin is an artisan cheese community and authentic buffalo mozzarella should be one this community and country boasts. Wouldn’t it be nice to know it all started here with 5 water buffalo and a husband and wife with a dream. Craig would be so proud. In the mean time I need to milk more than two at a time, this takes too long I and cannot sustain the feeding regiment with one wheelbarrow so more milking stalls and milking equipment, an ATV with a cart for hay transport, calf huts and gates and improved picnic area are critical to our survival. The plan is to hire help, get better equipment and ramp up production to bring this company to where it needs to be to sustain itself and go retail. Ramini Mozzarella is looking to hire a Rancher to help with feeding and caring for animals and pasture management. (Must know electric fencing). We are also looking for a milker. Someone who has lots of affection for animals and will nurture and socialize them in addition to milking them.